Radishes have been available at the farmers markets for quite a few weeks. This week, we focus on the radish for two very special reasons. My two adorable grandchildren Vinny and Giada. 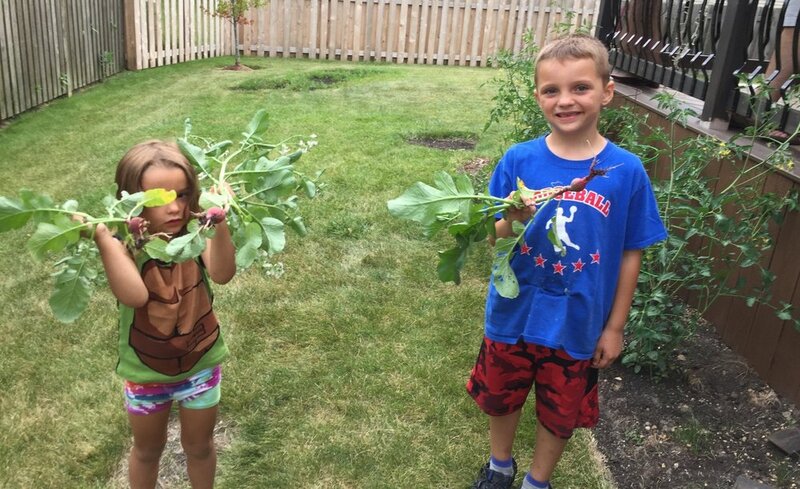 After our marshmallow roasting the other day, as evidenced on Vinny’s face, the kids were thrilled to finally pick the radishes they grew this summer. Look how Happy they are to yield such a fabulous crop!! I can honestly say that their facial expressions changed drastically upon tasting the fruits of their labor! Vinny quickly exclaimed that they tasted like dirt and I suspect the peppery little zing on their tongues was not appreciated! Neither of the kids realized what hidden nutritional super powers lurked in the beauties they had just plucked from the ground. Let’s see what both radishes and their greens have to offer, besides a glorious, peppery zing for our taste buds. Radish (raphanus sativus) are root vegetables from the cruiciferous group of brassicaceae plants. Other members of this family include: arugula, bok choy, kohlrabi, mustard, rutabaga, turnip, kale, collard greens, Chinese cabbage, horseradish, wasabi, broccoli, cauliflower, cabbage, Brussels sprouts, collards, Swiss chard, and watercress. As seen above and below, radishes can be found in a variety of shapes, sizes, and colors. They are grown in both warm and cold weather. They can be round, white, deep red, red, oval, long, small, square, oblong, black, magenta, pink, purple, lavender, green, rose, scarlet, globe shaped, short, and more! Unless people have been regularly exposed to eating radishes, they often don’t really know what to do with them besides, turn their nose up when they accompany their meal as a garnish. 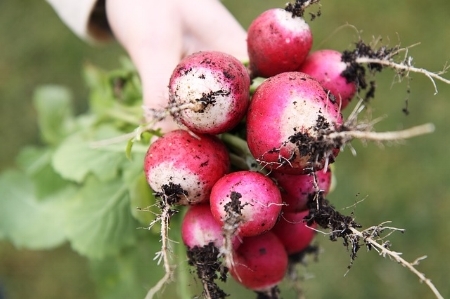 Both radish roots and greens can be eaten and, both provide many nutrition benefits. You’ll find them roasted, sautéed, pickled, sliced thin, julienned, grilled, grated, and braised. They offer a great zip that can really bring up the flavor in soups, on tacos, in smoothies and, added to many foods to provide great taste and texture. Check out all of the recipes to use radishes and/or radish greens at the end of the blog! The National Cancer Institute reports that cruciferous vegetables, such as radishes, may possibly help fight off prostate, colorectal, lung, and breast cancers. This is because, once radishes are broken down during chewing, chopping, and/or digestion, the glucosinolates in them create indoles, nitriles, thiocyanates and isothiocyanates. All of these are known as active glucosinolates that help neutralize carcinogens by fighting off inflammation, protecting DNA from mutations, and interfering with the formation and movement of tumor cells. Look at what only ½ a cup of two types of radishes offers! They help you meet your daily vitamin C needs which, helps the immunity, blood, and bones, and your daily fiber needs which, contributes to bowel regularity. Raw radishes are a great crunchy, low calorie snack that have decent amounts of potassium, vitamin B6, tryptophan, and manganese. Depending on what color radish you’re eating, any with reddish and blueish pigments contain anthocyanin, from the flavonoid group. Anthocyanin really packs some power because, not only do they protect the plants and/or foods from damage while growing but, after we ingest them, they are found to play an active role in lowering our risk for heart disease, mental deterioration, and many types of cancer. The French have made radishes famous by pairing them with butter, Fleur de sel salt, and a fabulous piece of bread. See if you can find a way to enjoy some radishes today!